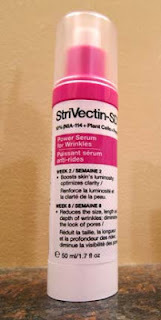 THE SKINNY: StriVectin-SD's Power Serum for Wrinkles is a high-end, anti-aging serum that I got to try out as part of the BzzAgent program. After using the serum twice a day for three weeks, I can say I'm pretty impressed with the results. Fine lines do appear to be fading and my skin looks a little smoother and happier. The serum is creamy and soaked in easily. I've used it under moisturizer and without moisturizer and in combination with StriVectin-TL Tightening Eye Serum. My skin never reacted to the serum, but be careful if you try it. Many testers on the BzzAgent site reported redness and some had allergic reactions to the ingredients. KEEP OR TOSS: Keep. I really like this serum and will use the whole bottle. CHECK IT OUT: Find a full list of ingredients at the StriVectin website.